A large decline in oyster landings was reported in 2012 and has continued through 2014 for Apalachicola Bay and other areas along the west coast of Florida where the state’s oyster fishery is based. Efforts conducted through the University of Florida’s Oyster Recovery Team, described conditions prior to and after the historic collapse of the oyster fishery. Their report reviews possible causes and outlines a plan for future monitoring, research, and fishery management. In August 2013, the U.S. Secretary of Commerce declared a commercial fishery failure for the Florida oyster fishery. Shellfish farming was introduced on the west coast of Florida during the 1990s as part of retraining opportunities for seafood workers affected by increasing regulations. Although these programs demonstrated that oysters could be grown using on-bottom methods, they were not successful. Unlike cultivating hard clams, oysters proved too labor-intensive and costly to grow. Today, there is renewed interest in oyster culture. With decreased supplies from the fisheries and higher dockside prices, the economics may be more favorable. Further, the success of Florida’s clam culture industry provides a model for the oyster industry in their recovery efforts. 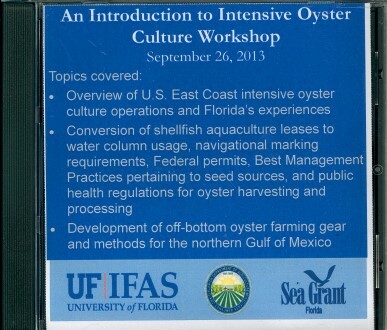 In partnership with the Department of Agriculture and Consumer Services (DACS), Division of Aquaculture, the UF IFAS Shellfish Aquaculture Extension Program began offering a series of workshops on oyster culture to bring current information to interested clam farmers, fishermen, and others. These workshops are held in two locations – FSU Coastal and Marine Lab in St. Teresa and Senator Kirkpatrick Marine Lab in Cedar Key. The first four workshops were video-taped and DVDs are available upon request (see Contact Us). In addition, workshops have been held to identify leaseholders, who are interested in modifying their leases for water column use, and to assist them in moving forward with the process. Presentations and hand-out materials from all of these workshops can be accessed here. Photo of Auburn University’s Oyster Demonstration Farm provided by Bill Walton.